I’m friends with these four guys: Mike, Dylan, Sam and Julian. They’re in a band called The Hell Yeah Babies, and I think they’re pretty great. One day while in a group DM with Dylan, I offered to make Sims of them. I was thinking about spicing up my Black Widow Challenge stream by introducing the possibility of these new characters being seduced by my Black Widow, or at least becoming her friends. Dylan agreed, and so then I figured I’d just make the whole band. But then things got tricky. The hard part was adding their traits. 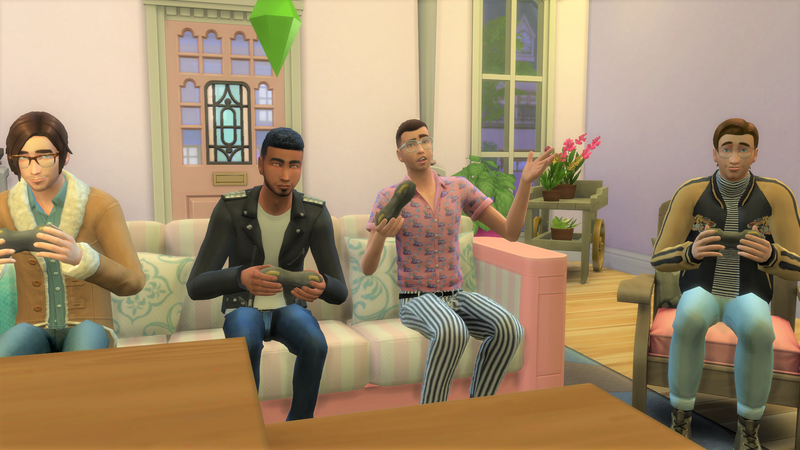 In The Sims 4, each Sim has up to three personality traits that define their autonomous behavior. When I’m inventing random people, I like to add two positive traits and then a negative one. If my Sim is Outgoing and Creative, sometimes I’ll also make them Clumsy or Lazy to even it out. You can’t really do that with a Sim you’re making of a real person—at least, not if you want to tell them about the Sim you made of them. The Hell Yeah Babies are all great dudes, and I love them. Like any people, they have both positive and negative qualities. But deciding which ones to immortalize in their Sim forms was harder than I thought. They all live and breathe music, so giving them all the Music Lover trait was obvious. But Sam has a tendency to not hang with the rest of the group when they go out. Should I give him the Loner trait? Or would that feel like an insult to him? Mike started dancing in his underwear after breakfast, but he was tense, so he’s dancing ANGRILY. Sometimes, that does tie into certain physical similarities as well. You never want to emphasize parts of a person’s body that they might be insecure about, but sometimes those are the things that make someone’s appearance the most distinctive. The Hell Yeah Babies are all pretty skinny, but I ended up adding more muscle tone to their Sims because making them look true-to-life felt kinda mean. Of course, now I’m saying that in this article, so I’m still being mean. Crap. You guys don’t have to start lifting weights unless you want to! I know music is your true passion! If you make a Sim of a friend, you want them to feel flattered, not called out. I think I did okay with The Hell Yeah Babies. They all ended up with pretty neutral traits. Most of them are Creative and Music Lovers, but Mike is also a Goofball, while Dylan has the Geek trait—trust me, he’s a real nerd.